TableFX is an amazing table surface computing technology that turns ordinary horizontal surfaces into interactive tables, interactive bars and interactive countertops. 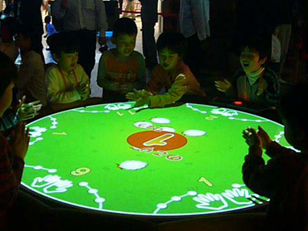 This table technology is an incredible tool to present interactive table advertising, entertainment, games and special effects. Using advance camera technology and patented body tracking software, TableFX creates a dynamic interactive table with gesture control interactivity. Users can interact with breathtaking visual effects, games and ads with simple hand and body motions. GestureTek’s digital tables can also be delivered with a multi-touch interface on a table computer screen, providing a truly unique multi-touch interactive table surface computing interface. TableFX is part of GestureFX series which also includes GroundFX, WallFX, and ScreenFX. ScreenFX technology is also used for interactive advertising on Interactive windows and Interactive storefronts.